Java-Gaming.org > Games Center > Contests > Game Jolt Contest #5: Indie Game Demake! 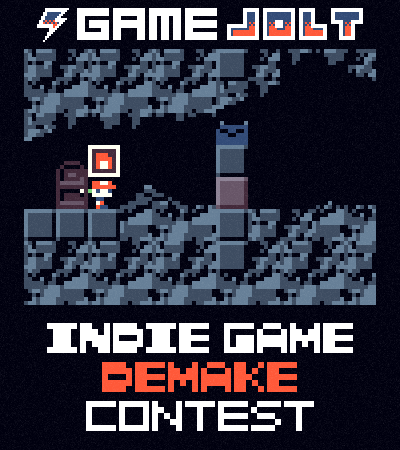 Game Jolt Contest #5: Indie Game Demake! Firstly, you have my apologies if you've already seen this over at the Slick forums! Game Jolt are holding another contest (the first in quite a while! ), and it would be great to see some entries created with a real programming language; none of that easy GM stuff! The contest started on July 1st 00:00 EST (view the start time in your location) and ends on July 8th 00:00 EST (view the endtime in your location). Three winners will be picked. Each winner will have their game featured on the site. The 1st prize winner will also be able to pick a game from Steam (no bundles) and one of KniteBlargh's awesome Game Jolt T-shirts! - We've noted that the IndieGames.com blog tend to feature items they see featured Game Jolt. If you need any help getting an applet up on the site, there's a thread on Slick and also a thread on Game Jolt. Your Java games don't have to be applets, if you select "freeware" when you upload your game, you can bundle it in a zip, runnable jar, exe, etc. I won't rant on about it here - all of the rules are posted on this page.